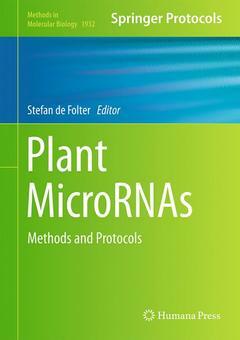 This detailed volume provides a collection of protocols for the study of miRNA functions in plants. Beginning with coverage of miRNA function, biogenesis, activity, and evolution in plants, the book continues by guiding readers through methods on the identification and detection of plant miRNAs, bioinformatic analyses, and strategies for functional analyses of miRNAs. Written in the highly successful Methods in Molecular Biology series format, chapters include introductions to their respective topics, lists of the necessary materials and reagents, step-by-step, readily reproducible laboratory protocols, and tips on troubleshooting and avoiding known pitfalls. Authoritative and cutting-edge, Plant MicroRNAs: Method and Protocols aims to ensure successful results in the further study of this vital area of plant science.